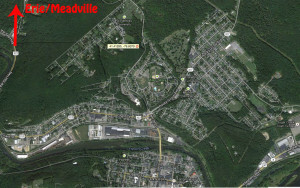 Please fill out the scale points scoring ahead of time from this PDF. It would be super helpful and speed things up if you fill these out before you come and print them or bring them along. I have Excel version that does the math for you and a pdf. Either can be printed and filled out and brought to the comp on Sunday. This will just speed up the hour of tech in. Only 3 more days until the next comp! I am sorry that the signup was broken, but I did fix it and you can sign and pay online if you want. You can pay the day of the comp if you want. I have special Christmas presents for everyone who attends. *wink wink* Hope to see you all there! Don’t miss out on the 3rd comp. The sponsors list is growing and this proves to be a great season. Last comp we had some newcomers and they did great. We had a blast. Hope to see you all again. Please be sure to signup. WOOT! WOOT! More sponsors for this years event! 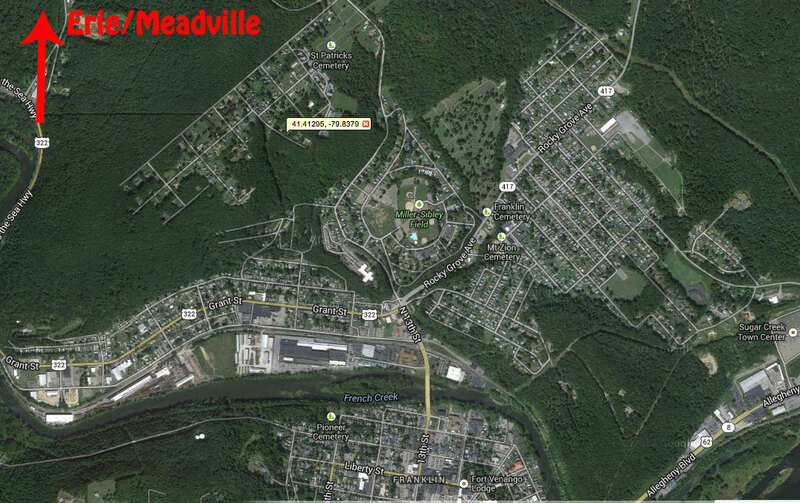 Put 6 Polk St, Franklin, PA 16323 into your GPS to find us. 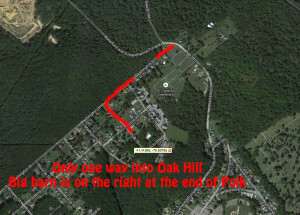 The maps show you there is only one way to get in to Oak Hill neighborhood so finding us is easy. 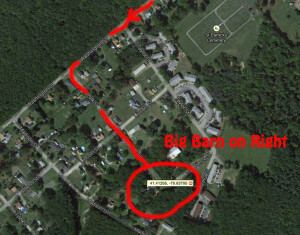 There is parking in front of the barn. Please dress warmly. There is no heat in the barn. Pit tables are limited, if you can bring your own folding table and chair, then please do so. 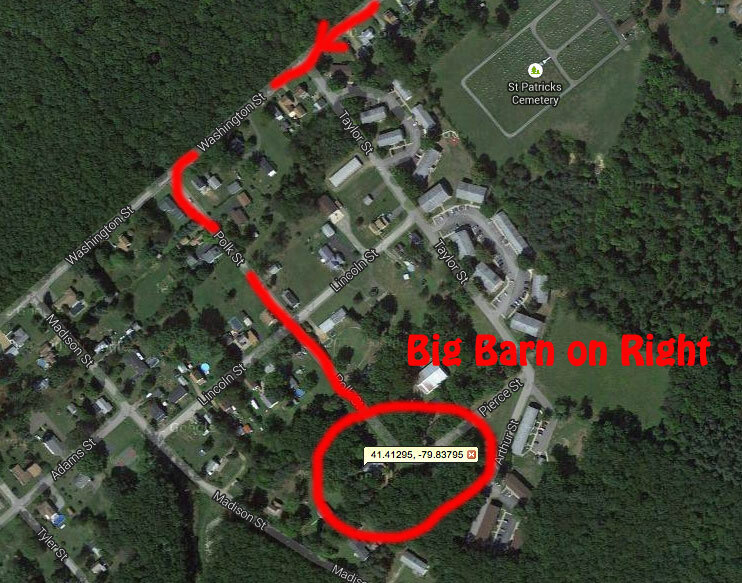 Coffee snacks and lunch food will be available for purchase in the mess hall next to the barn. Proceeds will help to benefit the church group that has been gracious enough to let us use the facility. Please register so we can be prepared. 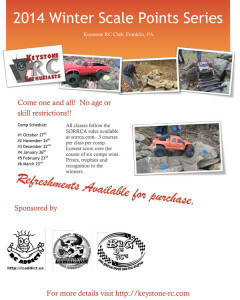 Click the Comp Sign Up button at the top of the http://Keystone-rc.com page. 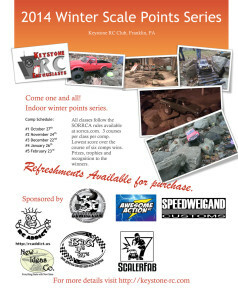 The 2nd comp of the 2nd annual Keystone RC Winter points series will be held at the barn behind RC Addict Garage in Franklin, PA on November 24th at 10am. Come ready to run scale trucks offroad, and have fun with other RC friends. No age limit restrictions. All rigs must adhere to SORRCA.com rules and guidelines. Max of -40 scale point divided in half. Time limited courses with a maximum penalty of 40 points. DNF is 40 – gates cleared – scale points. A DNS is 50 with no deductions. 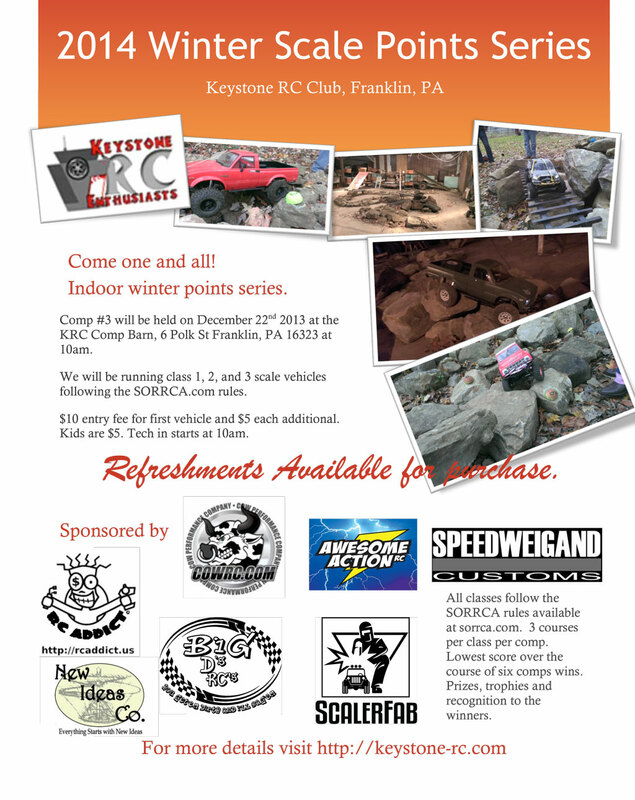 $10 entry fee for first rig, and $5 each additional. $5 entry for kids. Refreshments available for purchase. Dress warm as the barn doesn’t have much heat. Please sign up so we can have a head count. You can pay online or at the doors. Starting Sunday October 27th at 1pm we will be running scalers class 1, 2 and 3 if there are enough rigs. 3 courses per class. 10 gates per course. Each course will have a maximum time limit. 40 scale points Max divided in half. Following SORRCA rules for classes and points. One comp event per month for 6 months. You get to drop your worst Comp score and total the remaining 5. 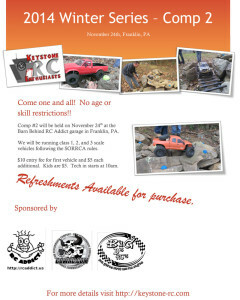 Entry fee is $10 for first rig and $5 each additional. First comp is outdoors the rest will be inside. There will be refreshments available for purchase at each comp. Look forward to having you all.